Originally published in 1942, during the Second World War and a time of great social and economic upheaval, Henry A. 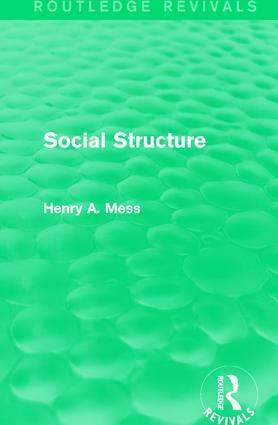 Mess endeavours to give a succinct account of the main elements in social structure and of their interrelations. He offers discussions on such broad topics as human nature, the role institutions play in society, and warfare as a universal feature of societies. This title is a short and accessible introduction to sociology and will be of value to students interested in the subject.